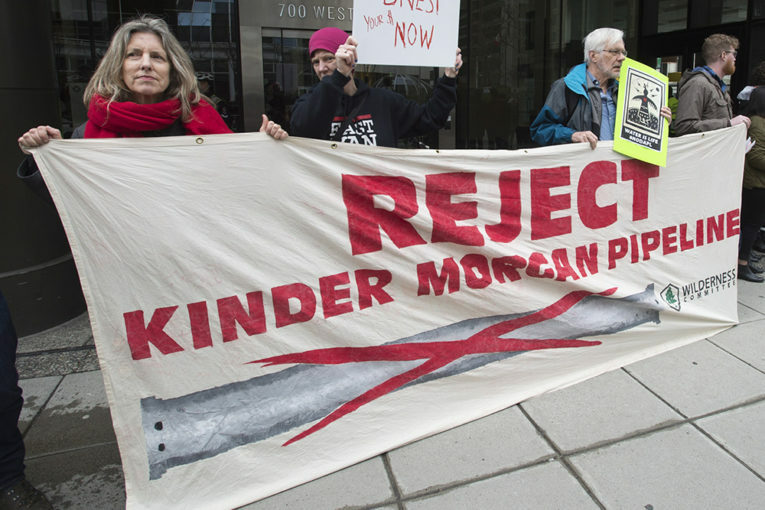 A lawyer for Kinder Morgan Canada said political opposition to the Trans Mountain project in Burnaby, B.C. has “poisoned the well” and disrupted the regulatory review process in the city. Arguing in a hearing before the National Energy Board Monday morning, Maureen Killoran said the lengthy delays in permit approvals from the city have set back the $7.4-billion pipeline expansion project and is seeking on behalf to have the NEB step in and override local bylaws. The action is necessary because strong and vocal opposition by Burnaby Mayor Derek Corrigan to the project has created an atmosphere of opposition, even if he has not specifically interfered in the process, said Killoran. “It has poisoned the well within the city of Burnaby. We are not going to get an efficient process there,” said Killoran. The company has been frustrated at the lack of firm timelines, guidance, and structure in the local process as it tries to secure permits for actions like tree removal and fence installation ahead of construction of oil storage and loading facilities in the city, she said. Killoran said that it doesn’t matter why the permits have been delayed, only that the local delay is standing in the way of federal approval which said the project was in the national interest and so is asking the NEB step in on constitutional grounds. Burnaby, which has yet to present oral arguments, said in its legal filings that Trans Mountain’s constitutional question is misguided and premature because the city has yet to make any decisions on the permits. The city said that it has not made any permitting decisions, and that Trans Mountain hasn’t shown that the city has improperly delayed the process and challenged the notion of the permits being delayed at all. Burnaby said that while federal cabinet approved the project in late 2016, Trans Mountain didn’t apply for its Burnaby permits until June and that the city has since been processing them as they do other applications. Killoran said the lack of clarity on the process and local control over the project means the city could stall the project indefinitely, going against the wishes of the federal government. Michael Davies, Kinder Morgan Canada’s vice president of operations, said in an affidavit that it could cost the company between $30 million to $35 million in salaries, corporate support and other expenses for each month of delay in the project, while the company stands to lose more than $90 million in revenue for every month the start-up is delayed. Previous : Infographic: Where do B.C.’s parties stand on electric cars?